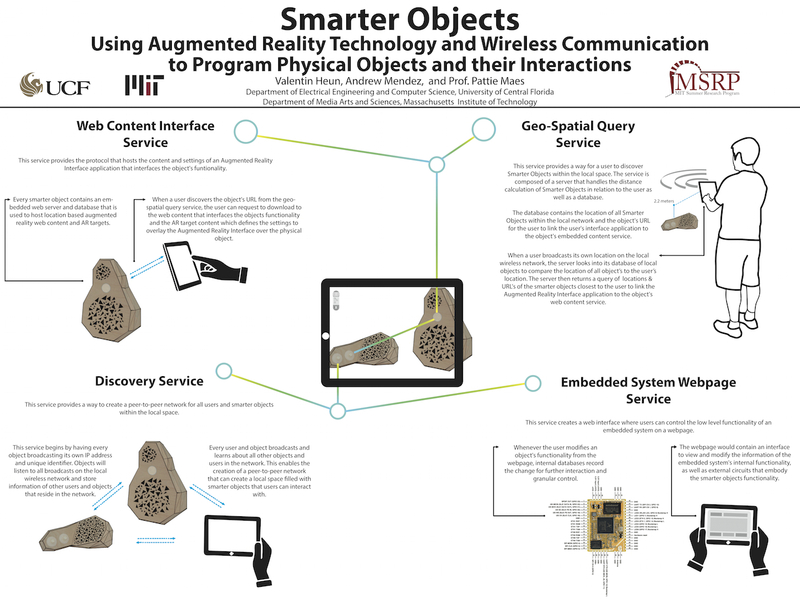 In the Summer of 2014, I completed a nine week internship at the MIT Media Lab where I worked with Professor Pattie Maes and a graduate student, Valentin Heun, on the Smarter Objects project. Smarter Objects is an Internet-of Things-Platform that utilizes an Augmented Reality (AR) interface to modify and re-program the functionality of household objects. The goal of this internship was to investigate and develop a client-server architecture and a communication network that enables smarter objects to interact with the user iOS application and other smarter objects. Built a node.js web server that queries a geo-indexed MongoDB database. This server connects to an iOS application and links this application to Wifi enabled Smarter Objects located near the user. Utilized node.js to develop a RESTful web service, which hosts content that defines Smarter Objects' properties and functions and hosts information needed for iPad to generate an AR interface. Created a discovery service using node.js and UDP. This service automatically sets up a peer-to-peer network that allows the users and Smarter Objects to communicate and interact with each other. Programmed with Socket.IO and node.js to build an embedded system webpage service that uses a webpage downloaded from the RESTful web service as an interface to allow the user to modify the properties and functions of Smarter Objects in real-time. Developed and tested this service using Arduino Yún and Carambola 2 embedded systems.